Why choose the Hand Grip Strengthener??? -Quickly increase hand wrist finger forearm strength with the best hand exerciser. Hand grip strengtheners are a key part of a fast, healthy recovery from ailments like tennis elbow, carpal tunnel, and tendonitis. People with ongoing afflictions such as rheumatoid arthritis will truly appreciate the relief they can get from working with the gripper and therapy squeeze balls. Recovery after surgery or a broken wrist will progress much more smoothly with regular practice using the hand exerciser. Teens, as well as adult men and women, will find working with the hand strengthener a comfortable fit. The level of resistance can easily be adjusted to the needs of the person using it, from 22 to 88 lbs, so seniors and teens will get just as much use out of the gripper as a rock climber who is looking to increase their grip strength to advanced levels. 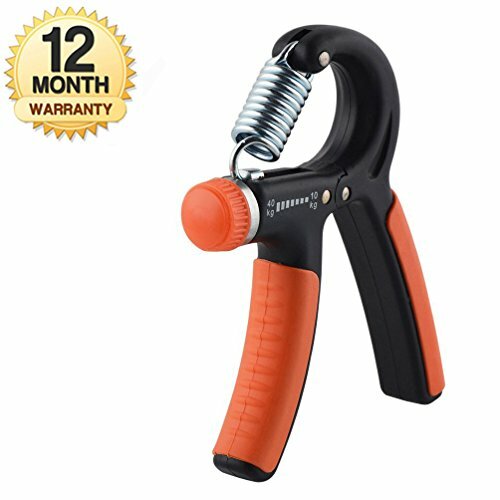 CLICK ADD TO CART ABOVE NOW TO ENJOY YOUR PREMIUM HAND GRIP STRENGTHENER! 【DURABLE CONSTRUCTION】built with high-quality strong chrome springs and Non-slip handle covered with soft comfortable and durable rubber, ideal machine for kids, teens or adults, women or men for weight and strength workout. 【OPTIMAL STRESS RELIEF】squeeze and soothe anxiety away while increasing blood flow to your hand, finger, and arm. 【12 MONTH MANUFACTURERS WARRANTY!】Just Contact The Seller via Amazon.com for any claims, we will provide you with the best service to make you 100% satisfied. 【REHABILITATION-HELPING】 Hand grippers also work great for rehabilitation. If you suffer from rheumatoid arthritis, arthritis, carpal tunnel, tendonitis, tennis elbow and are on the way to recovery from a fractured or broken wrist, or tendon surgery, then this is the perfect gripper for you. 【ERGONOMICALLY DESIGN】Perfect for men and women, seniors and teens; Non-slip handles covered with softy, comfortable and durable rubber for frequent and comfy usage. If you have any questions about this product by XIANLIN, contact us by completing and submitting the form below. If you are looking for a specif part number, please include it with your message.